Transmissive (backlit) grayscale step charts such as the Imatest 36-patch Dynamic Range or 36-patch High Dynamic Range chart, as well as charts from Stouffer, Kodak, DSC Labs, and Danes-Picta. Transmissive charts, which have higher maximum densities than reflective charts, can be used to measure dynamic range from a single image. 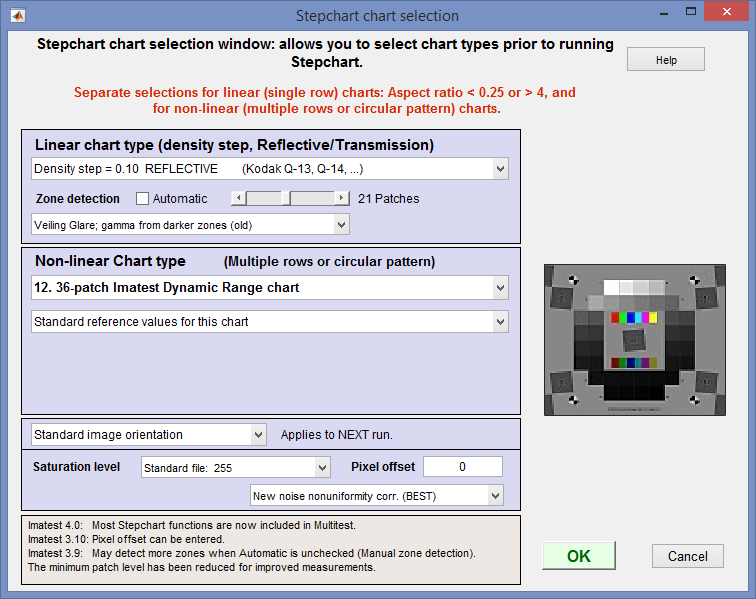 Stepchart can also measure veiling glare (susceptibility to lens flare). 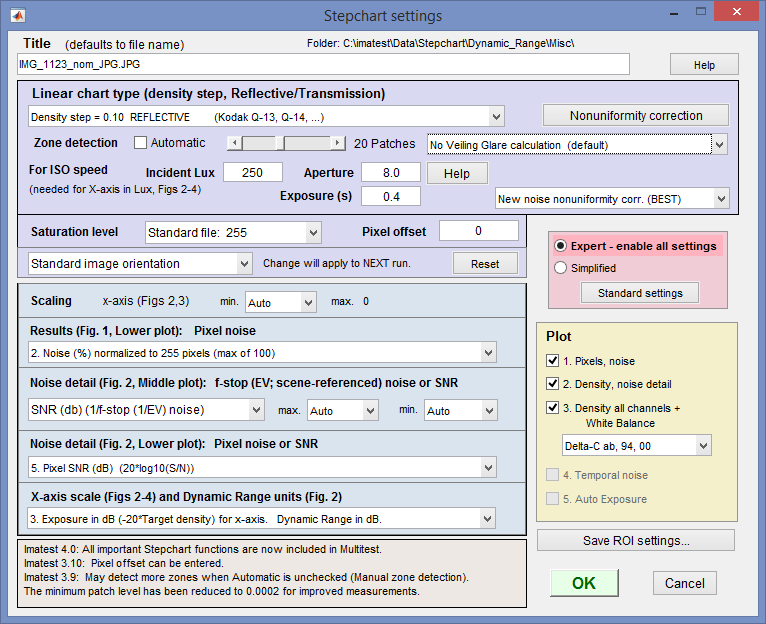 Most Stepchart functions are now included in Multicharts (an interactive module) and Multitest (a fixed; batch-capable module with identical calculations to Multicharts), both of which are newer and offer a greater selection of results plots and noise and dynamic range analyses. These modules are recommended for new work. News: Nonuniformity correction, long-available, has been documented. 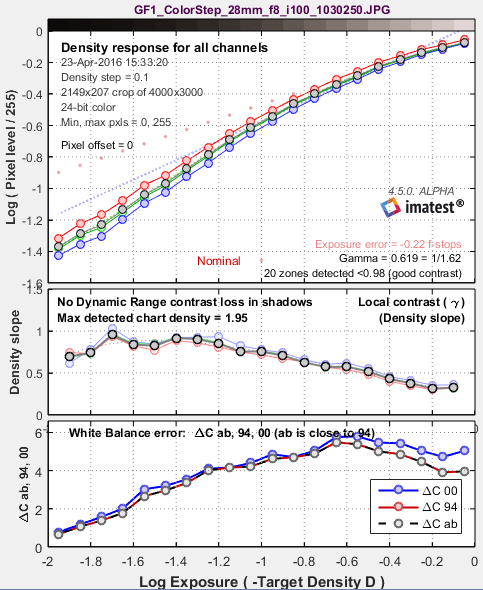 Imatest 5.1 (starting December 2018) The exposure error calculation has been improved to be more consistent over a range of contrast (gamma) values. Details here. Imatest 5.1 ALL Stepchart functions including temporal noise are now included in Multitest. Most were included in Imatest 4.0. Stepchart chart type can be selected prior to running Stepchart with Stepchart Chart Selection (in the Settings dropdown menu). Automatic region detection is supported with the 36-patch Dynamic Range, ISO 14524 (with registration marks) and ISO 15739 (with registration marks) charts. The Kodak/Tiffen Q-13 and Q-14 Gray Scales are inexpensive 8 and 14 inch long charts consisting of 20 zones, labeled 0-19, which have optical densities from 0.05 to 1.95 in steps of 0.1 (reflectance from 0.891 to 0.011). The charts are printed on a luster (semigloss) surface. The Q-13 image on the right was photographed very slightly out of focus to minimize noise from chart texture. Several monochrome targets, shown below, can be analyzed with Imatest Master. To run them, open the image file, then select the approximate region of interest for the key features in the target, following the instructions in Stepchart with Special/ISO targets. Additional dialog boxes allow you to specify the target type and refine the crop. Light. Be sure the light is even and free of glare. Lighting uniformity can be measured with an illuminance (Lux) meter. A variation of no more than ±5% is recommended. If possible, the surroundings of the Step chart should be gray or black to minimize flare light (unless you are measuring flare light). An 18% gray surround is recommended for cameras with auto-exposure. For reflective charts, as little light as possible should come from behind the camera— it can cause glare and flatten image tones. At least two lamps with an incident angle of about 20-45° are recommended. Lighting recommendations can be found in Building a Low-Cost Test Lab. Be especially careful to avoid glare in the dark zones on the right of the Q-13/Q-14 charts; it can hard to avoid with wide angle lenses. The light should not emphasize the texture of the chart, which would cause erroneous noise measurements. For transmissive charts, as little stray light as possible should reach the front of the chart. Use black curtains if needed. Focus. The chart may be photographed slightly out of focus to minimize noise measurement errors due to texture in the patches. Slightly is emphasized— the boundaries between the patches should remain distinct. Distance. Distance is not critical. The width of the chart image should be no more than about 2/3 of the total image width to minimize vignetting (light falloff, which can be serious with wide-angle lenses). The noise analysis will be most accurate if each patch is 50 pixels wide, but fewer are adequate for low resolution cameras. Increasing the size improves the accuracy of the noise measurement up to a point, but there is little improvement for patches over 100 pixels wide. Tonal response can be measured with very small images, as long as the zones are distinctly visible. Save the image as a RAW file, TIFF, or high quality JPEG, then load it on your computer. Raw images can be converted using dcraw (for commercial files) or Read Raw (for binary files). If you are using another RAW converter, convert to JPEG (maximum quality), TIFF, or PNG. Stepchart setup may be simplified by clicking Settings (dropdown menu in the Imatest main window), Stepchart selection… This opens the Stepchart chart selection window (shown on the right) that lets you select chart types for linear (single-row) or non-linear (multiple-row) charts prior to running Stepchart. This can be helpful with automatic region detection. Click on the Stepchart button in the Imatest main window. Open the input file using the dialog box. Imatest remembers the directory name of the last input file opened (for each module, individually). Combined (averaged) files are useful for measuring fixed-pattern noise (at least 8 identical images captured at low ISO speed are recommended). The combined file can be saved. Its name will be the same as the first selected file with _comb_n appended, where n is the number of files combined. Batch mode allows several files to be analyzed in sequence. There are three requirements. The files should (1) be in the same folder, (2) have the same pixel size, and (3) be framed identically. For the first image the settings window is identical to standard non-batch runs. Additional runs use the same settings. Since no user input is required they can run extremely fast. Temporal noise (noise representing the difference between images) can be measured by selecting 2 files of identical (but separately acquired) step chart images, then selecting Read two files for measuring temporal noise in the Multi image file list dialog box. Crop the image. The crop aspect ratio determines whether the analysis is for a linear (single-row) or nonlinear (multiple row) chart. For linear charts, the Zone detection setting shown below determines how regions are selected, and hence how you crop. When Automatic is unchecked (or for nonlinear charts), small blue rectangles for each of the patches will be displayed in the Fine Adjustment window, i.e., you immediately see the selected regions. For linear charts you need to enter the number of patches. When Automatic is checked, the patches are located automatically: no rectangles are shown during the region selection. Because this can cause problems in noisy images and dark regions, we recommend leaving Automatic (zone detection) unchecked. To measure veiling glare, Automatic must be unchecked. Make the appropriate selection in the dropdown menu on the right and select 21 regions (for the Q14) (the total grayscale patches plus one). Typical crops (for Automatic zone detection are shown on the right, indicated by red rectangles. The orientation does not need to be correct; Imatest will rotate the image to the correct orientation. To display the exposure error correctly (reflective targets only), select the entire chart, including any clipped highlight patches that may be present. If the aspect ratio (length / width) of the crop is less than 4:1, a settings window for one of the nonlinear (multiple-row or circular) charts will appear (for Imatest Master and IS). If you plan to use manual Zone detection (selected in the Stepchart input dialog box, below), the selection can be approximate: a Fine adjustment window will open after the Stepchart settings window to enable you to refine the crop. Crop of a Stouffer T4110 chart (better without the tilt). Make any needed changes to the Stepchart settings box. You can select either Expert or Simplified mode for the settings window. In Simplified mode many settings are grayed out so they can’t be set. If you press Standard settings, commonly used settings (recommended for beginners) are selected. Title Defaults to file name. Feel free to add useful descriptive material. Nonuniformity correction (available since Imatest 3.9) allows you to correct for nonuniform illumination using a separate flat field image taken under identical conditions. Opens the Nonuniformity correction window described in Nonuniformity Correction in grayscale and color chart modules. Zone detection For linear (single-row) charts you select either Automatic or Manual Zone detection with the Automatic checkbox. If Automatic is unchecked, select a fixed number of patches (6-41) with the slider for Stepchart analysis, and a fine ROI adjustment box appears after OK is pressed. This option is useful when there is high noise in dark regions or when veiling glare is to be calculated. (Zone detection can also be set from ROI Options in the Imatest main window.) We strongly recommend leaving Automatic (zone detection) unchecked. Fine ROI selection (dialog box detail) lets you preview region locations: Details here. Incident lux (for ISO Sensitivity calculations) When a positive value of incident light level (not blank or zero) in lux is entered in this box, ISO sensitivity is calculated and displayed in the Stepchart noise detail figure. More details are on the ISO Sensitivity and Exposure Index page. Also required if Lux is selected for the X-axis scale (figs 2-4). Aperture and Exposure must be entered for the x-axis of Figures 2-4 to be displayed in units of Lux. They are normally obtained from EXIF datan if available, but they may be entered manually if needed. Scaling You can select the minimum value of the x-axis for figures 2 and 3. This setting defaults to Auto. Setting it manually allows several successive runs to be scaled identically, which can clarify comparisons between different cameras. Results (Fig. 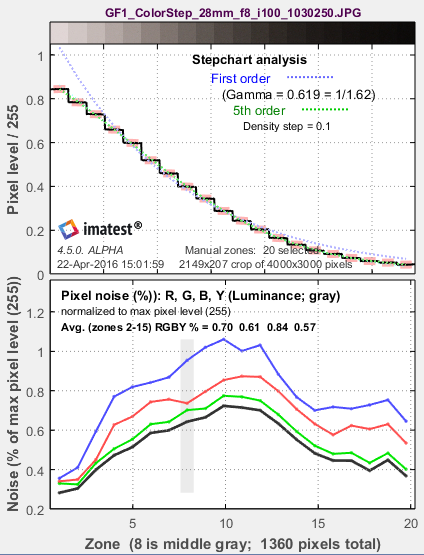 1), Lower plot: Pixel noise Three noise displays are available for the lower-left plot in first figure. Noise in pixels (maximum of 255) Values 0-255. Noise Detail (Fig. 2), Middle plot: f-stop noise or SNR Two types of display are available for the middle-left plot of the second figure. The effects of gradual illumination nonuniformities have been removed from the results. SNR (based on f-stops) Scene-references Signal-to-Noise Ratio, based on f-stops. Note that there are many ways of defining SNR. Most are image (or pixel)-referenced. Results are different from S/N in the lower plot (which is more standard). The scaling (minimum and maximum values) can be set in the dropdown menus to the right of the radio buttons. Most of the time these should be left at Auto. The values are inverted when the display is toggled between F-stop noise and SNR. For example, the minimum value of the x-axis in both Figures 2 and 3 can be set between -4 and -1.5. Noise Detail (Fig. 2), Lower plot: Pixel noise or SNR Five types of display are available for the lower-left plot of the second figure. The first three are the same as the lower plot of Fig. 1. The effects of gradual illumination nonuniformities have been removed from the noise results. All displays are derived from Noise in pixels (the third selection below). In the notation below Ni is RMS noise and Si is signal (pixel) level for patch i. Noise (%) normalized to image density range = 1.5 100% * (Noise in pixels) divided by (the difference in pixel levels between light and dark patches that have a density difference of 1.5). This difference is close to the 1.45 White-Black difference in the ColorChecker. Useful because it references the noise to the scene: noise performance is not affected by camera contrast. Noise in pixels (maximum of 255) Noise in pixels ( Ni ). Values 0-255. Pixel S/N (Signal in patch/RMS noise) dimensionless Noise in pixels ( Ni ). Values 0-255. Pixel SNR (dB) (20*log10(S/N)) 20 Log10(signal/noise) for each patch (where signal = pixel level). Units of dB (decibels). Doubling S/N increased dB measurement by 6.02. For this selection, SNR_BW is also displayed. SNR_BW is an average SNR based on White-Black patch levels (density difference = 1.5), close to the W-B difference in the ColorChecker. It’s designed to be relatively independent of the chart type and system contrast (gamma). SNR_BW = 20 log10((SWHITE–SBLACK )/Nmid ), where Nmid is the noise in a middle gray patch (closest to nominal chart density = 0.7). Log exposure (-target density) for x-axis. Dynamic Range in EV. Lux (incident Lux / 10^density) for x-axis. Dynamic Range in EV. Exposure in dB (-20*Target density) for x-axis. Dynamic range in dB. Log exposure for x-axis. Dynamic Range in Density units. F-stops (EV) for x-axis. Dynamic Range in EV (F-stops). The Plot box on the right lets you select figures to display. Two files must be read in to obtain the Temporal noise plot. When all settings have been made, click OK to continue. The example was photographed with the Canon EOS-10D at ISO 100 and converted from RAW format using Capture One with default settings (no curves applied). The results include tonal response and noise. Colorcheck produces a similar result, but with less tonal detail. Three figures are produced for color images; two for B&W. The upper plot shows the mean normalized pixel level of the grayscale patches (black curve) and first and second order density fits (dashed blue and green curves). The horizontal axis is the zone (patch number; proportional to the distance along the target for linear charts). A portion of the patches themselves are shown just above the plot. The equations for the density fits are given in the Algorithm section, below. The second order fit typically closely matches the patches. For automatic zone detection, the differentiated and smoothed steps used to find the boundaries between zones are displayed as light cyan spikes (not shown). The lower plot shows the RMS noise for each patch: R, G, B, and Y (luminance) in units selected in the Settings Window (above). For this display, noise measured in pixels can be calculated by multiplying the percentage noise by 255. 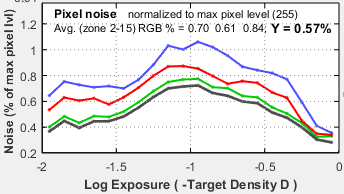 Noise can be normalized to 255 pixels, expressed in pixels (maximum of 255), or normalized to the pixel difference corresponding to a target density range of 1.5 (the same as the white – black patches on the X-Rite ColorChecker). Options are described above. Noise is largest in the dark areas because of gamma encoding: In the conversion from the sensor’s linear output to the color space (sRGB, here) intended for viewing at gamma = 2.2, the dark areas are amplified more than the light areas and the noise is boosted as well. See Noise in photographic images for a detailed explanation of noise: its appearance and measurement. dynamic range (only reliable for transmission step charts because reflective charts have a smaller tonal range than most cameras). The upper left plot shows the density (tonal) response (gray squares), as well as the first and second order fits (dashed blue and green lines). Density (logarithmic) plots correspond to the workings of the human eye. They resembles a traditional film density response curves. Dynamic range is grayed out because the reflective Q-13 target has too small a density range to measure a camera’s total dynamic range. See Dynamic range, below. This curve is closely related to the Opto-Electronic Conversion Function (OECF), which is a linear curve of exposure vs. pixel level. Exposure error (Exp err) is described here. The upper right box contains dynamic range results: the slope-based dynamic range (Imatest 4.5+) and the range for several quality levels, based on luminance (Y) noise. Details below. It is shown in gray when a reflective target is selected. The middle left plot shows the scene-referenced Signal-to-Noise Ratio (SNRscene) in dB (the inverse of the noise in f-stops (or EV), shown below, which is the noise scaled to (divided by) the difference in pixel levels between f-stops). SNR tends to decrease (noise increases) as brightness decreases. The logarithmic vertical axis displays dark area noise levels clearly. 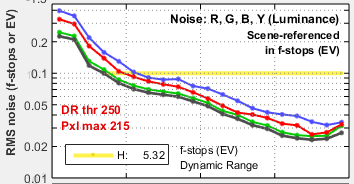 Dynamic range information is displayed when the range for a specific quality level (defined by maximum f-stop noise or minimum SNR) is within the range of the plot. It is omitted if noise or scene-referenced SNR is better than the specified level for all patches: it is not reported for quality levels lower than H in the above plot because SNR never drops below 12dB (f-stop noise < 0.25): the M-H level). f-stop (scene-referenced) noise (1/SNRscene ) can bedisplayed in the middle-left plot in place of SNRscene. The lower left plot shows pixel noise or SNR displayed in one of several different ways. The above-right illustration shows pixel SNR (dB) = 20 log10(Si/Ni), where Si is the signal (mean pixel level) of patch i and Ni is the noise (standard deviation of the pixel level, with slow variations removed) of patch i. The plot below is the lower left plot set for pixel noise normalized to 100%. The middle right region shows selected EXIF data (metadata). The lower right plot shows the noise spectrum for a middle gray region. Demosaicing by itself causes the spectrum to drop to about 0.5 at the Nyquist frequency (0.5 cycles/pixel). Digital camera images with strong noise reduction will have more rapid falloff. SNR_BW is an average SNR for signal S based on white-black patch levels (density difference = 1.5), which is the Black-White density difference for the Colorchecker. It’s designed to be relatively independent of the chart type and system contrast (gamma). SNR_BW = 20 log10((SWHITE–SBLACK )/Nmid ), where Nmid is the noise in a middle level patch (closest to nominal chart density = 0.7). Here are the results for ISO 1600. 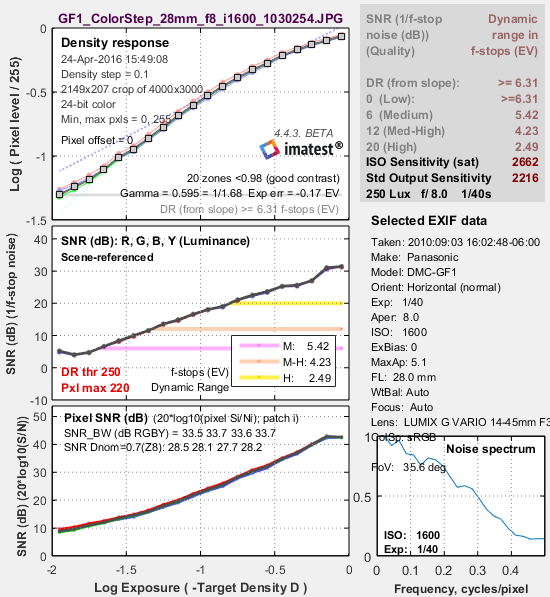 Tonal response is similar to ISO 100, but SNR is significantly decreased (noise is increased). The noise is highly visible, but the image is still useful for many purposes. It might not be suitable for fine portraits, but it would be acceptable when a grainy “Tri-X” or “available light” look is desired. The middle-left plot displays dynamic range for several quality levels, specified by the minimum SNRscene (maximum noise) within the range. 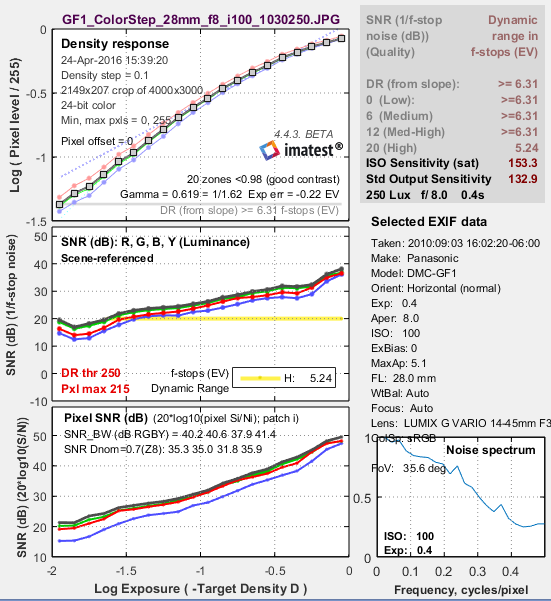 The dynamic range for low quality (L; blue) has a minimum SNRscene of 0dB (1:1; a maximum noise of 1 f-stop); the dynamic range for high quality (H; yellow) has a minimum SNRscene of 20dB (10:1; a maximum noise of 0.1 f-stop). The upper plot shows the density response (small circles) of the luminance (Y), red, green, and blue channels, as well as the first and second order fits (dotted and dashed gray lines). It resembles a set of traditional film density response curves. The R, G, and B curves are not displayed in Imatest Studio. The middle plot shows the slope of the density curve, which can also be regarded as the local contrast or gamma. This curve is the derivative of the density, d(Density) / d(Log Exposure). The lower plot is the color error, measured as ΔCab (geometrical distance in the CIELAB a*b* plane), ΔC94 , and ΔC2000. They are quite close because chroma tends to be quite low for grayscale patches. Lens flare (stray light that bounces between lens elements and off the barrel) can be measured by photographing a reflective step chart (a Q-13 or Q-14) against dark and white backgrounds. When flare light is present (white background) it will reduce the slope of the density response in dark regions of the step chart (on the left of the plot). This curve makes it easy to measure the decrease in the slope. Temporal (time-varying) noise is the random difference between otherwise identical images. It is measured as the noise (standard deviation) of the difference two identical test chart images divided by the square root of 2 (1.414). Subtracting two images removes fixed pattern noise. The square root of 2 is needed because noise powers add, even though image pixels are subtracted. Dividing by the square root of 2 scales temporal noise to be the same as noise measured in an individual image. To measure temporal noise, select two images for analysis. In the dialog box shown on the right, select Read two files for measuring temporal noise. The analysis proceeds normally (for the first file), but a fourth figure, displayed if 4. Temporal noise is checked in the input dialog box Plot area, contains the temporal noise analysis. This figure is intended to be self-contained, hence repeats some features of previous plots. The upper-left plot displays the density response, similar to the upper-left plot of Figure 2. The lower-left plot (RMS noise (f-stops)) displays scene-referenced noise or SNR using the same scale as the middle-left plot of Figure 2. In these plots, noise (or SNR) for a single image is shown as a pale curve. The upper-right plot (Pixel SNR (dB)) displays noise or SNR using the same scale as the lower-left plot of Figure 2. The lower-right plot (Noise in pixels) displays pixel noise scaled the same as the lower plot of Figure 1 (for the vertical axis; the x-axis is different). When the Stepchart calculations are complete, the Save Stepchart Results? dialog box appears. It allows you to select figures to save and choose where to save them. The default is subdirectory Results in the data file directory. You can change to another existing directory, but new results directories must be created outside of Imatest— using a utility such as Windows Explorer. (This is a limitation of this version of Matlab.) The selections are saved between runs. You can examine the output figures before you check or uncheck the boxes. Figures, CSV, and XML data are saved in files whose names consist of a root file name with a suffix and extension. The root file name defaults to the image file name, but can be changed using the Results root file name box. Be sure to press enter. Checking Close figures after save is recommended for preventing a buildup of figures (which slows down most systems) in batch runs. After you click on Yes or No, the Imatest main window reappears. Imatest can calculate Dynamic Range in several modules using several types of test chart. Dynamic range from a single transmissive chart image. Stepchart, Multicharts, Mutitest A transmissive chart is such as the Imatest 36-patch Dynamic Range or HDR chart is required because reflective charts do not have sufficient tonal range. Dynamic range from multiple (differently exposed) images Dynamic Range module Uses CSV output of Stepchart of Multitest for several differently exposed images. Usually used with reflective charts, but transmissive charts may also be used. ISO 15739 Dynamic Range from patch with density ≈ 2 Multicharts, Multitest, eSFR ISO Extrapolates Dynamic Range from a single patch with density ≈ 2. Raw sensor Dynamic Range Multicharts, Multitest Fits raw data to an equation from the EMVA 1288 standard, then extrapolates to find DR. The test chart does not have to have as large a tonal range as the DR, but transmissive charts with tonal range ≥ 3 are recommended. 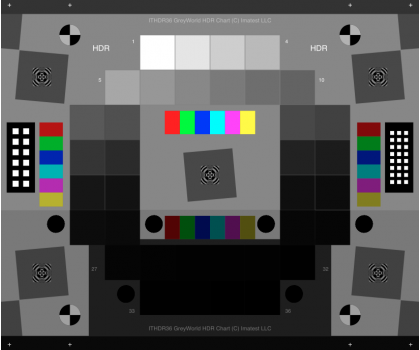 Dynamic Range (DR) is the range of scene brightness (tones) over which a camera responds with good contrast and/or a good Signal-to-Noise Ratio (SNR). Imatest Dynamic range can be defined in two ways. (introduced in Imatest 4.4) The range of tones where slope of the density curve is greater than 7.5% of the maximum slope (on the dark side) and less than 98% of the saturation level (on the light side). This has to be done with care since noise and irregular density steps in the original data affects patch levels, and hence slope measurement. Test chart density is interpolated to have 101 evenly-spaced points, then the log pixel level for these points is found using the Matlab interp1 function. The curve is smoothed using a rectangular kernel 7 points wide (approximately 1/13 of the total range). This algorithm gives stable, robust results, much better than earlier (pre-4.4) Patch range and detected DR measurements. This method is not typically used for pictorial imaging because noise can be severe in the darkest regions. Dynamic range can be expressed in any of the following units. decibels (dB), where 1 density unit = 20dB; 1 f-stop = 6.02dB. The dynamic range corresponding SNRscene = 1 (0dB; 1 f-stop of noise) corresponds to the intent of the ISO 15739 Dynamic range definition in section 6.3 of the ISO noise measurement standard: ISO 15739: Photography — Electronic still-picture imaging — Noise measurements. The Imatest measurement differs in several details from ISO 15739; hence the results are not identical. Imatest may well produce more accurate results because it measures DR directly from a transmission chart, rather than extrapolating results for a reflective chart with maximum density = 2.0. The most straightforward way to measure a camera’s (or scanner’s) dynamic range is with a transmission step chart illuminated from behind by a lightbox. Reflection step charts such as the Kodak/Tiffen Q-13 or Q-14 are inadequate because their density range of around 1.9 is equivalent to 1.9 * 3.32 = 6.3 f-stops, well below that of digital cameras (though several different exposures can be combined in the Dynamic Range postprocessor for Stepchart and Multitest). The table below lists several transmission step charts, all of which have a density range of at least 3 (10 f-stops). Kodak Photographic Step Tablets can be purchased calibrated or uncalibrated. Uncalibrated is usually sufficient. The Stouffer charts are attractively priced. The Stouffer T4110 (13.3 f-stops range), Danes-Picta TS28D (13.6 f-stops range), or TE 241 (13.6 f-stops range) are often used for Digital SLRs, which can have dynamic ranges over 10 f-stops. The Stouffer T4110 (shown on the right) is inexpensive and has Dmax = 4.0, but is difficult to frame, difficult to expose properly with auto-exposure cameras, and susceptible to light falloff due to its linear arrangement. The Imatest 36-patch Dynamic Range test chart, with density steps of approximately 0.1 from base density to base+3.4 (an 11.3 f-stop range) or the 36-pach High Dynamic Range (HDR) test chart, with density steps from 0.1 to 0.3 and a maximum density of at least base+6 (20 f-stops), are strongly recommended. A nearly circular patch arrangement ensures that vignetting has minimal effect on results. A CSV or CGATS reference file with actual densities (required with the HDR chart) is supplied. the chart has an active area of 7.75×9.25 inches on 8×10 inch film. It also contains slanted edges in the center and corners with 4:1 contrast for measuring MTF. The edges have an MTF50 >= 16 cycles/mm, which is about 3 times better than the best inkjet charts. Registration marks make the regions easy to select, and fully automated region detection is available in Imatest 4.0+. A neutral gray background helps ensure that the chart will be well-exposed in auto exposure cameras (compared to charts with black backgrounds, which are sometimes strongly overexposed). The standard 36-patch Dynamic Range chart can be used with the Dynamic Range postprocessor to measure dynamic ranges larger than 11 f-stops if several manual exposures are available. Dmax = 3.4 is sufficient for camera phones and digital cameras with small pixel sizes, but high-end DSLRs and HDR security and automotive cameras generally have higher dynamic ranges, which makes them well suited for measurements with either Dynamic Range or the HDR chart (which never requires the Dynamic Range postprocessor). on 8×10 film. Dmax > 6.0. This chart is produced with a high-precision LVT film recording process for the best possible density range, low noise, and fine detail. You’ll need a lightbox that can evenly illuminate the transmission step chart. 9×12 inches is large enough in most cases. Avoid thin or “mini” models, which may not have even enough illumination. Fluorescent light boxes should have high frequency ballasts to eliminate flicker. The GLE-10 and GLE-16E, available in the Imatest store are recommended. 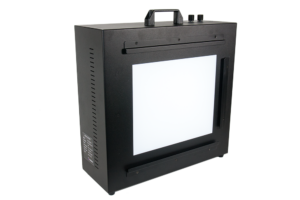 LED light boxes (for example, the Artograph 12×9 inch model) are nice because they’re inexpensive, flicker-free (DC power supplies) and easy to dim (if you have a current-limited DC power supply), but they are not reliable for color measurements. Lightboxes available from the Imatest Store are compared in the Lightbox Comparison Guide. The best available lightbox is the Imatest LED Lightbox (shown on the right), available from the Imatest store. It has several advantages over the lightboxes mentioned in the previous paragraph. Much more uniform illumination: up to 95% uniformity. High quality spectral response. The standard version allows you to choose from 3100K, 4100K, 5100K, 5500K, 6500K and NIR color temperatures (850nm or 940nm) with a Color Rendering Index (CRI) of 97. Intensity is adjustable via a hardware knob, Bluetooth, or USB from as low as 1 lux and up to 100,000 lux: a range of over 300:1, making it suitable for measurements from near-daylight to extremely dim light. Reflective charts: Incident light measurement is relatively straightforward. Place an incident illumination meter with a flat diffuser (such as the inexpensive BK615) just in front of the chart, pointed towards the camera, making sure not to block any of the illumination. Use the lux measurement directly. Lux (input to Imatest) = Lux (measured) * 1.11. Note: EV @ ISO 100 is also known as Light Value (LV). Place the chart on the lightbox— or any source of uniform diffuse light. Be sure to block direct light from the lightbox outside of the chart: Stray light can reduce the measured dynamic range; it should be avoided. Photograph the chart in a darkened room. No stray light should reach the front of the target; it will distort the results. The surroundings of the chart should be kept as dark as possible to minimize flare light. Use your camera’s histogram to determine the minimum exposure that saturates the lightest region of the chart. Overexposure (or underexposure) reduces the number of useful zones. 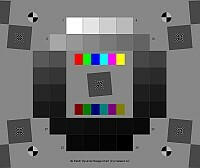 The lightest region should have a relative pixel level of at least 0.98 (pixel level 250 or 255); otherwise the full dynamic range of the camera will not be detected. If the lightest zone is below this level, and a transmission chart is selected, a Dynamic range warning is issued. For flatbed scanners with transparency units (TPUs, i.e., light sources for transparencies), you can simply lay the step chart down on the glass. Stray light shouldn’t be an issue, though there is no harm in keeping it to a minimum. 35mm film scanners may be difficult to test since most can only scan 36mm segments. (Most transmission targets are longer.) For scanners specified as having Dmax greater than 3, the charts of choice are the Stouffer Transmission Step Wedge T4110 or Danes-Picta TS28D, which are too large to be tested easily with 35mm film scanners. Follow the remainder of instructions in Photographing the chart and running Stepchart, above. Be sure to select the correct chart type from the Stepchart input dialog box (right). The dynamic range is the difference in scene brightness ( (–) chart density) between the zone where the pixel level is 98% of its maximum value (250 for 24-bit color, where the maximum is 255), estimated by interpolation, and the darkest zone that meets the measurement criterion (minimum SNRscene or density response slope). The repeatability of this measurement is better than 0.5 f-stop. 10, 12, 6, or 0 (dB) The recommended measurement in most cases. Image sensor spec sheets typically define DR using a minimum SNR = 1 (0dB). Slope (> fraction of maximum slope) 0.05 of maximum The slope measurement involves careful interpolation to make it robust. Darkest regions may be very noisy. 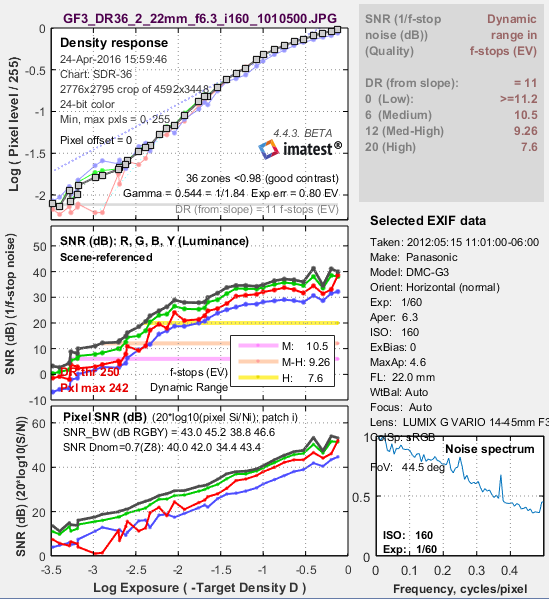 Sensor dynamic range can be measured from absolutely raw images (no demosaicing or processing of any king) with Multicharts or Multitest using the technique described in Multicharts/Multitest/eSFR ISO Noise. It can also be measured with a sequence of flat field exposures (often involving calibrated neutral density filters). But these measurements should never be confused with a camera system measurements (especially for HDR systems) because each image has essentially zero dynamic range. Here is a result for the Panasonic G3 (a Micro Four-Thirds camera with 3.75 micron pixel pitch) at ISO 160, converted from raw using dcraw with the following settings: Demosaicing: Normal RAW conversion (demosaiced), Output gamma: 2.2, White Balance: Camera, Output color space: 48-bit, Quality: Default. Panasonic G3, ISO 160, Converted with dcraw. The slope-based dynamic range is greater than 11 f-stops. The Dynamic Range at low quality level (scene-referenced SNR = 1 = 0dB) is 9.33 f-stops, decreasing to 5.68 f-stops at high quality level (SNR = 10 = 20dB). These results are unchanged for 24-bit raw conversion. The shape of the response curve is a strong function of the conversion software settings. The plot below is for the same exposure, saved as a JPEG file inside the camera. Note that the transfer curve is quite different: it has a “shoulder” in the highlights, which improves pictorial quality by reducing the tendency of highlights to saturate (“burn out”). Dynamic Range is increased due to software noise reduction (absent in the dcraw conversion). Dynamic range is improved due to software noise reduction. Units for displaying Dynamic Range can be set in the X-axis scale (Figs 2-4) and Dynamic Range units (Fig. 2) dropdown menu. To convert dynamic range from f-stops into decibels (dB), the measurement normally given on sensor data sheets, multiply the dynamic range in f-stops by 6.02 (20 log10(2)). 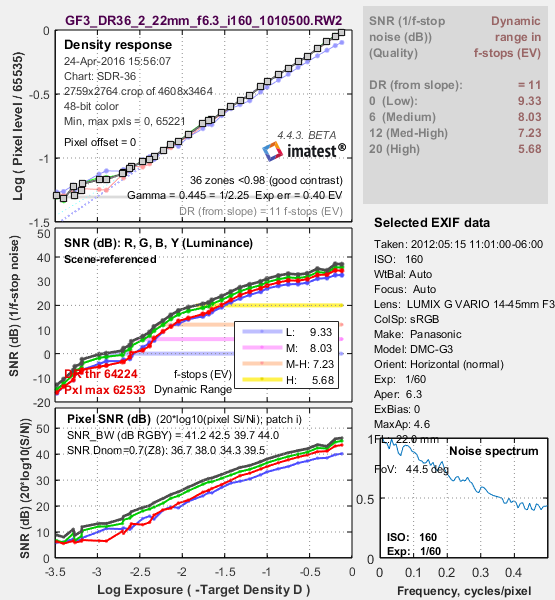 The dynamic range for low quality (f-stop noise = 1; SNR = 1) corresponds most closely to the number on the data sheets. An optional .CSV (comma-separated variable) output file contains results for Stepchart. Its name is [root name]_summary.csv. An example is Canon_EOS10D_Q13_ISO400_crop_summary.csv. Module SFR, SFR multi-ROI, Colorcheck, or Stepchart. Tables Tables are separated by blank lines. The first table contains measured and ideal pixel levels and densities. The second table contains density = -log(exposure) and Y, R, G, and B densities (-log(pixel level/255)), assuming 8 bits/pixel. The third table contains the density differences (slopes) between the Y, R, G, and B patches. The fourth table contains two sets of Y, R, G, and B noise measurements for the the patches in the bottom two rows, described above. The fifth table contains S/N and SNR (dB) for the Y, R, G, and B channels, described above. (Automatic zone detection only) Locate the distinct zones in the image. This is done by taking the derivative of the pixel level averaged vertically, then smoothing it, illustrated by the light cyan spikes in the upper left plots in the above figures. A boundary between zones is detected if this function goes above a threshold. The threshold is adjusted to the lowest value that gives evenly spaced, regular intervals. This is an optimum detection algorithm: a lower threshold detects false boundaries (i.e., noise), while a higher threshold can miss valid zones. Find regions of interest (ROIs) for each zone, which comprises the central 2/3 of the zone. Calculate statistics for the ROIs, including the average pixel level and a second-order polynomial fit to the pixel levels inside the ROIs— this fit is subtracted from the pixel levels for calculating noise. It removes the effects of nonuniform illumination. Calculate the noise in each ROI. The noise is the standard deviation of the pixel level, after the second-order polynomial has been subtracted. Noise display options are given above. The noise spectrum is calculated for the seventh zone (middle gray) by lining up the pixels (with the second-order polynomial subtracted) into a 1D array and taking the Fourier transform (FFT). The independent axis is displayed in Cycles/pixel, where 0.5 is the Nyquist frequency. Using the average pixel values of the regions whose value is 10% below the maximum and above theminum, the average pixel response is fit to a mathematical function (actually, two functions). This requires some explanation. Using the average pixel values of grayscale zones for densities between approximately 0.1 and 0.9 (omitting the extremes near white and black), the average pixel response is fit to two mathematical functions to find gamma (contrast: first-order equation) and also a second order qeuation. This requires some explanation. Gamc is typically around 0.5 = 1/2 for digital cameras. Gamm is 1.8 for Macintosh systems; gamm is 2.2 for Windows systems and several well known color spaces (sRGB, Adobe RGB 1998, etc.). Images tend to look best when system gamma is somewhat larger than 1.0, though this may not hold for contrasty scenes. For more on gamma, see Glossary, Using Imatest SFR, and Monitor calibration. k3, k4, and k5 are found using second order regression and plotted in the green dashed curves. The second order fit works extremely well.